Gold regained positive traction at the start of a new trading week and climbed to near one-month tops, just above the $1231 level. The US Dollar weakened across the board on news that the US and China agreed not to impose additional trade tariffs for at least 90 days and this was seen as one of the key factors benefiting the yellow metal. Looking ahead, today's anticipated speeches by FOMC members, along with the release of US ISM manufacturing PMI are highly likely to impact the Fed's monetary policy which in turn will affect gold prices. After receiving a huge support from the $1220 level, Gold prices are back near the top levels above $1230. The stubborn $1228.26 resistance level was finally crossed to the upside after the yellow metal found the right traction with a bullish uptrend. 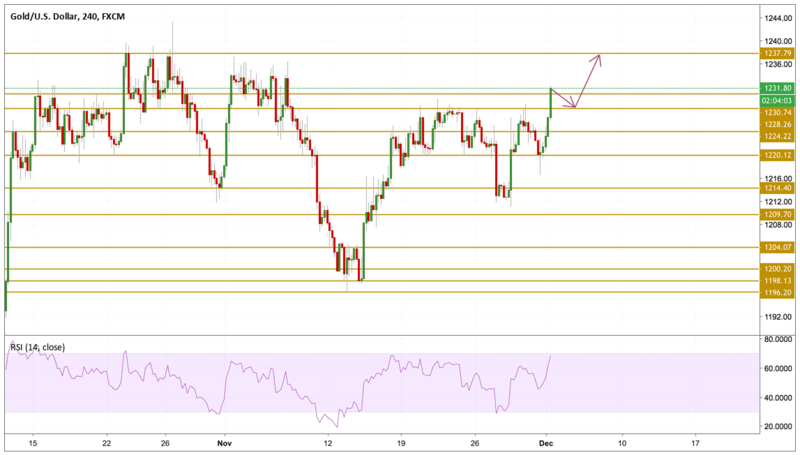 Overbought conditions are not far from being reached, as indicated by the RSI, which is why we will be focusing on a retest of the near support level before we can see the precious metal rallying back towards the $1237.8 resistance level.